Shares of state-owned MSTC fell 5 per cent during their stock market debut on Friday. 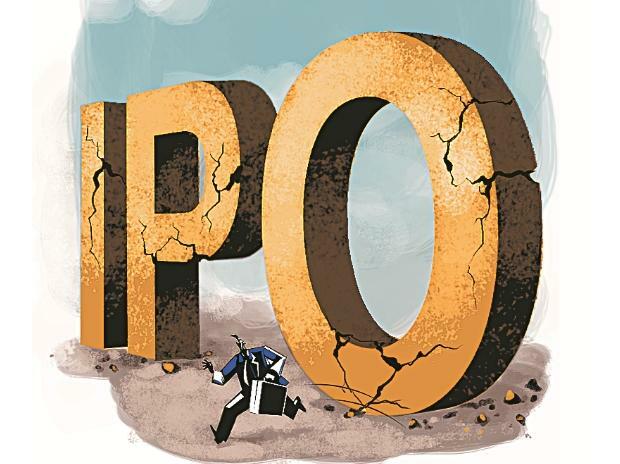 The weak listing followed lukewarm response to the Rs 225-crore initial public offering (IPO). 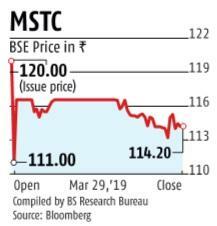 Shares of MSTC closed at Rs 114.2, compared to its IPO price of Rs 120 per share. The stock touched a low of Rs 111 during intra-day trade on the NSE, where nearly Rs 5 crore worth of shares were traded. Another Rs 86 lakh worth of shares changed hands on the BSE, where the stock touched a low of Rs 110 and a high of Rs 117. At the current market rate, MSTC is valued at Rs 804 crore. The government had to lower the IPO price band for MSTC and extend the closing date due to shortfall in demand. The MSTC IPO had closed on March 20 instead of March 15 as scheduled. The price band was changed from Rs 121-128 per share to Rs 120-128. The issue was priced at the lower end at Rs 121. While the non-institutional segment garnered full subscription, the company struggled to garner full subscription from institutional investors. Three-fourth of MSTC’s IPO had to be filled by institutional investors as the firm failed to meet the profitability criteria. Earlier this week, an official of the Department of Investment and Public Asset Management (Dipam) said the body was working on reducing the dependence on investments from public sector undertakings (PSUs) such as Life Insurance Corporation (LIC) and State Bank of India (SBI). “Last fiscal year, investment from LIC and PSU banks was about Rs 25,000 crore in disinvestment proceeds. This financial year, we have achieved around Rs 85,000 crore from divestments, with investments of Rs 5,000-6,000 crore coming in from PSU banks and insurance firms,” Dipam joint secretary Venudhar Reddy Nukala said earlier this week. In FY19, the government came out with five PSU IPOs. All five were less than Rs 500 crore in size. Besides MSTC, the centre launched IPOs of Midhani, Rites, Ircon International and Garden Reach Shipbuilers.